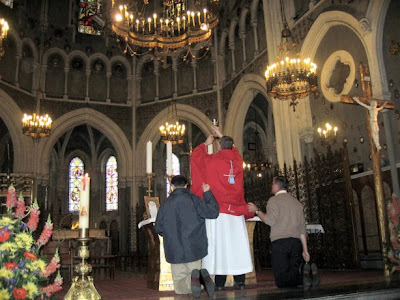 Fr George is working hard at Lourdes to make the TLM available for pilgrims. He is having to "make do" to a certain extent. At the moment he can't get hold of a maniple - but is having new vestments made; and various other requisites are still needed. Here's an idea. If you are in Lourdes, why not ask Fr George if there is anything he needs and get it shipped over to him? Yesterday, he celebrated a Missa Cantata in the Immaculate Conception Basilica and has posted some photos taken by a young father who was present with his wife and children. If I remember correctly, we had pilgrims from England, Ireland, Germany and USA. The language for the Mass was no problem, since everyone wants Latin! Isn’t that innovative in a place where, including all the pilgrims, there may be well over one hundred languages present?